Lee College students and faculty explored historical and cultural sites in Beijing, Xi’an and Shanghai this summer on the Study Abroad trip to China. The Study Abroad program provides students the opportunity to travel to another country while also earning credit for their Lee College degrees. From left: Instructor Sunny Jiang Schultz, Abigail Vernier, Cameron Lieck, Lucas McCrary, Saige Willingham, Emily Blumentritt, Shianne Willingham, Camila Acuna, instructor Chris Whitaker, Kayla Medina, Justin Mathews, and Jazmine Rodriguez. 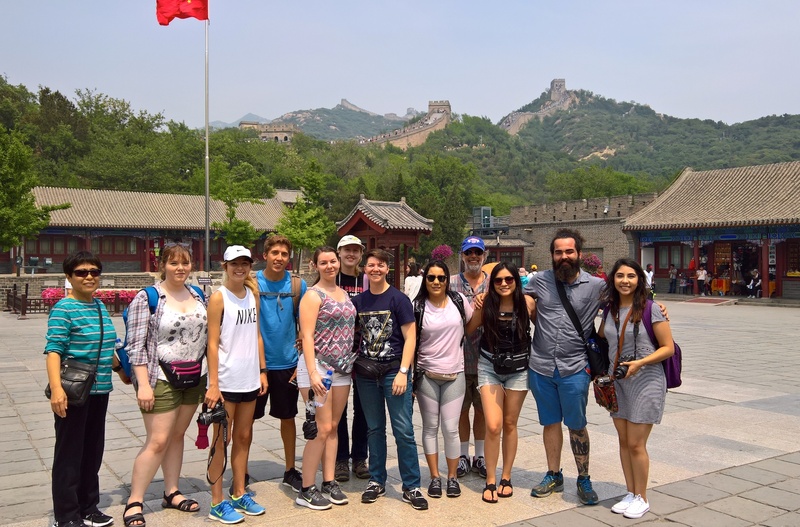 BAYTOWN, TX — Lee College Study Abroad students spent nine days in China this summer exploring the ancient and modern sides of the world’s most populous country at historic and cultural sites in Beijing, Xi’an and Shanghai — and all while earning valuable academic credits in the process. “I could make it through all my degrees and never leave Texas, but I wouldn’t be very cultured,” said Justin Mathews, one of six Study Abroad students who received a scholarship to help fund the trip and shared lessons learned with the campus community in mid-June after the group’s return to Baytown. While discussing American and Chinese attitudes toward each other over 250 years of shared interaction, Mathews noted that many of the Chinese people he encountered there — particularly children and youth — were eager to approach the students for photos and conversation. Study Abroad provides students the opportunity to explore another country while also earning credit for their Lee College degrees. The program was revived at the college in summer 2015 with a trip to Great Britain, Ireland and Wales. Since then, Study Abroad students have also traveled to Belize, China and Costa Rica; Germany is the next destination slated for summer 2018. Before traveling abroad, students enrolled in specially designed English, humanities and history courses taught by instructors Sunny Jiang Schultz and Chris Whitaker, who also accompanied them to China. The courses helped prepare the students for all they would see and experience on the trip, which included visits to the Forbidden City; Tienanmen Square; the Great Wall of China; the Shaanxi Provincial Museum; and the Shanghai World Financial Center. Students also visited a local school in Beijing, took in Tang Dynasty and acrobatics shows, participated in a tea ceremony and dined on Peking Duck and other Chinese cuisine. When they got back to campus, students delivered presentations on a variety of topics to illustrate how much they learned — from traditional Chinese medicine and common food choices, to Chinese treatment of natives and minorities, Chinese voyages of exploration and the differences between ancient Greek and Chinese philosophy. For more information about Study Abroad at Lee College, contact Nader Naderi, chairman of International Education, at nnaderi@lee.edu.